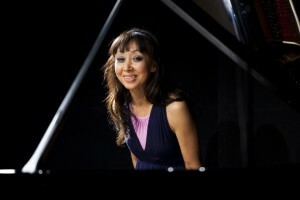 The South Korean born pianist Young-Choon Park began the study of the piano at the age of four and gave her first full recital when she was seven. She played the Beethoven Piano Concerto No.1 with the Seoul Symphony Orchestra at the age of nine. The young child prodigy studied at the Juilliard School in New York and later gained the highest masters degree at the Hochschule in Munich. She has toured extensively, giving over 50 concerts each year in Europe, Scandinavia, South Africa and the United States. She makes many return visits to major concert venues including the Birmingham Symphony Hall, St. David’s Hall in Cardiff, Belfast Waterfront Hall, Alice Tully Hall and Lincoln Centre in New York, and Tivoli Koncertsalen in Copenhagen. Young-Choon Park has also participated in many international music festivals and has performed with many leading orchestras in Europe. She gives regular recitals in Ireland. 0 Comments to "Young-Choon Park (piano) in St. Iberius Church"